September Acres shared this super easy and super creative way to create some customized art! 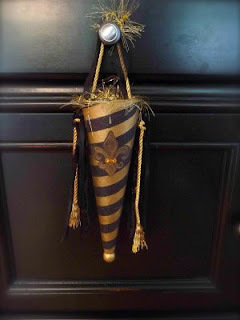 Room to Inspire took some odds and ends from around her house and created this great decorative cone! 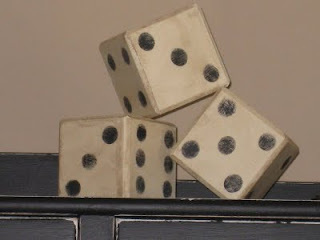 Shanty to Chic shares a tutorial on how to make these fun vintage-looking dice. 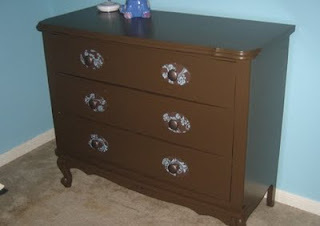 Carri at Little Orange Monkeys has a dresser redo that sports a brilliant fix for hard to find hardware sizes! I was so impressed by this!! I was completely amazed by this free laundry-room redo at 2 Brown Eyed Beauties! Enchantresses 3 shared a great entry table redo! Love everything about this beauty! Oh, and a heartfelt thanks to everyone who is now following the Shabby Nest on Twitter! Y'all know how to make a girl feel welcome! I really enjoyed last Friday's Linky Party...I got a ton of inspiration! i love furniture make overs, i have many cluttering my garage awaiting their turn with the sander and brush. i found you via Jeanette @ bliss. it was fun reading thru them. Thanks so much for featuring our entry table!!!! Such an honor! We know if you liked it, we did a good job! So many talented girls out there! Loved these ideas! Those were some great ideas! I'm sorry I missed the party. Thanks for sharing the highlights! Thanks for sharing all your awesome ideas!! I "borrowed" your site for a bit on my blog!